I decided I should do a timely movie review for those of you who might want to go see Thor this weekend. I bought a ticket online for the midnight show. Then I went to Rotten Tomatoes to familiarize myself with the cast. I was scrolling through the pictures of all the blue -eyed actors and thought I was going to be among my people. 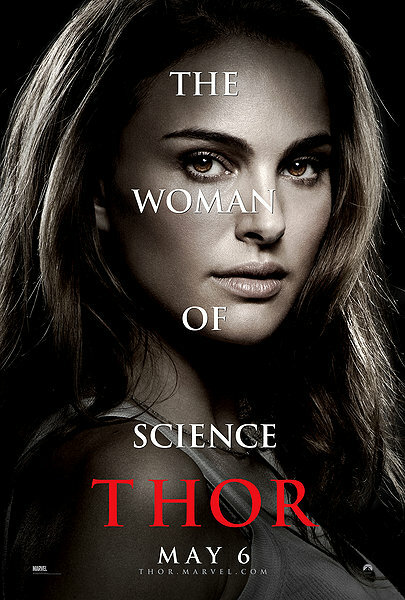 Then I came to this poster of brown-eyed Natalie Portman and I did a double take. She's the who? Scientist? I didn't know there was going to be science in it! Awesome! I immediately became paranoid that I might actually BE an "older biddie" so I inquired further about this anxiety. Len informed that he had a bad experience in a movie with centaurs. They elicited crude remarks. I thought about it for a moment and couldn't come up with anything crude to say about a centaur. Maybe he just happened to go to a showing at the same time as the Catherine the Great fan club. I think in fact the Czarina's demise was more like Elvis. There was a toilet involved, but no horse. This actually sounds pertinent to a news story I read today when I got home from an outing. On this outing I stopped at Starbucks on my way to go hiking. The pollen was bad so I went through a lot of Kleenex. I'm lucky I survived! According to the Guardian they linked sudden blood pressure rise to burst blood vessels in the brain. Straining on the toilet was the fifth highest risk. Poor Catherine.